The motif of the dying deity transcends many cultures, from Bladr in Norse mythology to Quetzalcoatl the Aztec feathered serpent god. Many gods die only to be reborn or brought back by some means. Many of these gods are associated with the cycle of the seasons or some form of vegetation (growth/harvest/death) cycle. Examples of this motif are Persephone am Ishtar who both go underground signaling the death of vegetation only to return bringing life once again. 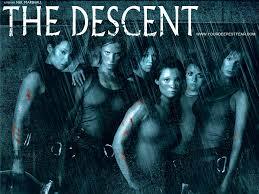 The film The Descent is an excellent example of a modern version of this motif. 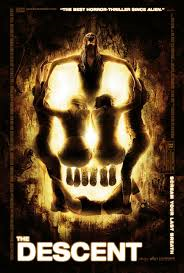 With the exception of one man who gets killed in the first few minutes of the film, the entire cast is female and all of these females embark on a descent into the underworld…literally in the form of a spelunking expedition. There’s a lot going on in this film. There’s a subtle hint that Juno has had an affair with Sarah’s husband. There’s the question of where the creatures (called crawlers) came from. But one of the biggest questions is after the opening tragedy, why does Sarah undergo such a dramatic change of character whilst underground? This whole expedition as set up by Juno as some kind of therapy for her friend Sarah, yet by the end Juno’s character is revealed and Sarah makes the awesome decision to exact vengeance. This may seem improbable, but after a literal baptism of blood, Sarah has reverted to a primal state. In one scene she is even primal man trying to make fire. It works. According to Joseph Campbell’s theory of The Hero’s Journey, the second stage is Ego Death which is a phase of separation, transition, and incorporation. This film depicts what that might look like as the protagonist, Sarah undergoes tragedy in the beginning. It is her journey to some kind of rebirth back into life that is the goal. Through the trauma of this misadventure that her friend JUNO (Roman name for the Queen of the gods and goddess of child birth) takes her on, Sarah is able to be reborn. In a vision at the end, we even see her being delivered back into the world through the opening in the cave through which she escapes as a powerful birth image. As she climbs upwards, it’s an image of the birth canal, until ultimately she emerges hands first, a breach birth that we soon find to be only a vision. Yet even though it’s a false image, we can tell from her face that she has transitioned through this separation from humanity above and from her sisters/friends below. The only remaining part to the complete cycle of ego death is the return to society to enrich the world with the knowledge accumulated. We don’t see that in this film; however, the knowledge of The Descent 2, tells us that Sarah did indeed make it out with the knowledge of the creatures in the underworld as its plot has her returning with authorities to determine the legitimacy of her claim before pressing charges for her friends’ murders. Usually this motif is a men's game, but Persephone and Ishtar and the women in The Descent prove women can play just as well!